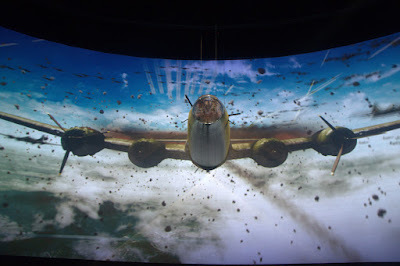 While in New Orleans for New Year's , we stopped in to see The National WWII Museum and the amazing Beyond all Boundaries show in the Solomon Victory Theater, which just opened in November. 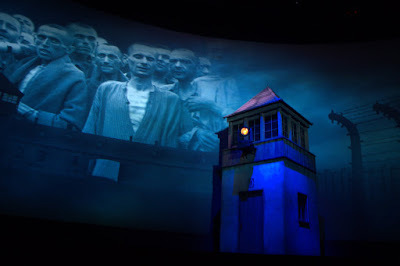 The show is a "4D" mixture of video, archival images, graphics, computer animation and real, 3D objects. Technical Direction and Coordination: It’s Alive Co.
Also, Audio By the Bay says they did music and sound design. We saw it on the afternoon of New Year's Eve. They had a few glitches at the start, and it took them about five minutes to get the show running. 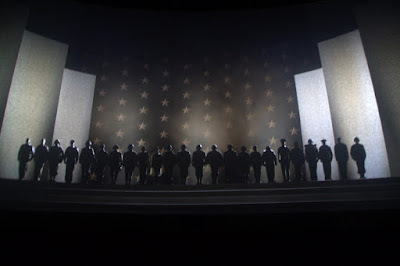 But the show ran perfectly after that, and aside from some grey light from the video projectors (which were apparently shuttered for really dark scenes), the show was very seamlessly presented. 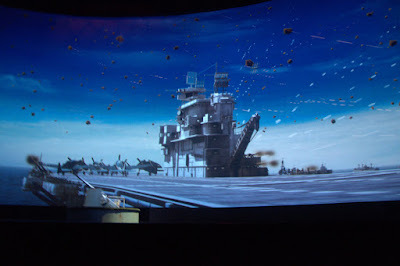 There are several physical layers, and quite a few 3D objects in front of and behind the screens. The sound was great, and so was the lighting, and the graphics were very well done. The nuclear explosion strobe sequence was pretty amazing too. It's a great show and well worth a visit!